This petition has been created by Cristina and may not represent the views of the Avaaz community. CLARAMENTE SE VE QUE NO QUIEREN QUE LA SOCIEDAD VEA EL ESTADO DEPLORABLE EN EL QUE REALMENTE SE ENCUENTRAN LOS ANIMALES DENTRO DE LA PERRERA. PARA ELLO PROHÍBEN REALIZAR FOTOS Y EXIGEN QUE SE VEAN EN SU WEB, DONDE PREVIAMENTE A HACER LA FOTO LOS SACAN DE LAS JAULAS PARA DAR UNA IMAGEN IRREAL DE COMO VIVEN ALLÍ. POR OTRO LADO, EL ZOOSANITARIO DE SEVILLA ES UN LUGAR PÚBLICO QUE PERTENECE AL AYUNTAMIENTO DE SEVILLA, Y QUE POR TANTO TODOS LOS SEVILLANOS PAGAMOS CON NUESTROS IMPUESTOS. 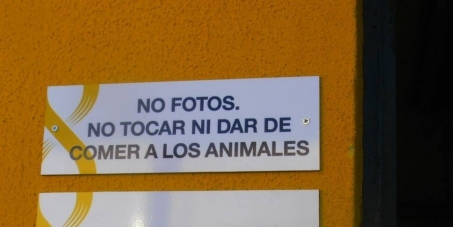 DESDE EL SUELDO DEL LACERO HASTA LA COMIDA QUE LLEGA A LOS ANIMALES QUE ALLÍ SE ENCUENTRAN POR LO QUE NO PUEDEN PROHIBIR A NINGÚN CIUDADANO NI LA ENTRADA NI TAMPOCO HACER FOTOS A LOS ANIMALES. ¡¡¡FIRMA PARA HACER LLEGAR NUESTRA QUEJA AL AYUNTAMIENTO DE SEVILLA!! !